I'm just going to list my thoughts & chat about them, as its probably the easiest way to analyze my feelings. I'm still wondering how to feel because I feel an odd yearning for more & NEED more from what I just put down. 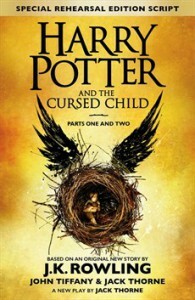 1) J.K Rowling did not write this particular book - The original story is hers, the magic is there, you can see glimpses of her for sure but the language: that British wit that she brandishes throughout all her books is not there. The characters don't feel like who I knew seven books ago. Is this deliberate? To demonstrate that the characters have changed with the modern times? To demonstrate that we are dealing with a whole new generation, therefore the lingo changes too? Parents pick up things from their kids? It feels like modern lingo has been thrown in randomly here and there - I can't tell if its accidental/on purposes/for script reasons. Personally, I didn't like it because I didn't feel like they were the characters I knew. I didn't feel like they were the authentic characters I loved so much. It was distracting & detracting. 2) If this story was written as a novel it would have been MUCH MUCH better - The script format is confusing at the beginning & hard to get into, but once you get used to it, the reading experience improves slightly. There are momentous things that happen reduced to mere sentences because of the format. I miss the explanations, the little details, the clues & HER WRITING! J.K WRITES MAGIC WITH MAGICAL WORDS. Her writing is glorious to read, she brings her characters to life with it! Why is that taken away??!!! For example: how do Severus & Albus know how to make polyjuice potion? They make it and use it. No further explanation.....Isn't this potion in the restricted section in the library? I know they have wizarding parents but still.....I want explanations! I want to know how they get the ingredients for it. I want to know which cupboard they raided from which corner of Hogwarts. I want every single detail of their lives dammit. 3) Why did J.K do it this way? - I do not understand why she chose to do this in a play format. Initially, when I first heard about it, I thought OMG that's awesome!Then I thought again. There will be millions of fans who will never get to see this play & therefore miss out on the drama of the script. Why do that to a fanbase so large? I'm sure, she has her reasons but I still don't understand it. She has touched so many people and yet she is only giving them a chance to glimpse a part of book number eight. 4) Is the story good? - Yes, it is sorta....I was annoyed when I first started reading it because I felt like all the favourite/momentous parts of all seven books have been taken and combined on to make the eighth book revolve around them. The ending sums up the created story. That's good right? 5) The friendship between Albus/Scorpius & Harry/Draco - Cute new generation, loved Scorpius and Albus as friends. The writing sorta hinted at a gay relationship? But then they have girl crushes. So yeah. Harry & Draco felt too happy happy joy joy after all that animosity in seven books. When did that happen? Was it explained? No. 6) Did I want to read about the new generation? - It's their parents I love. Their adventures. Their triumphs. Their losses. Oh the losses.....The new generation is nice & if this is the path the author wanted to take to tell the story, fine. But I wanted a well-written combination of both. Not this. Be warned. This is an emotional journey. Emotional because this is another HP book and that's momentous in itself but also due to the disappointing format & lack of detailed story. I would recommend this cautiously. If your expecting to revist your favourite characters, yes they are there, albeit a shell of their original selves but it's still them in some ways. They took me back in fleeting glimpses & that's all I got. So I'm still yearning for more. If you are expecting something like the rest of the series, you won't find it in this book. Read it because your a fan & then take the good and bad as it comes. That's what I'm trying to do. 3.5 helms because it made me think, made me emotional & because it took me back briefly to that magical world I love so much.